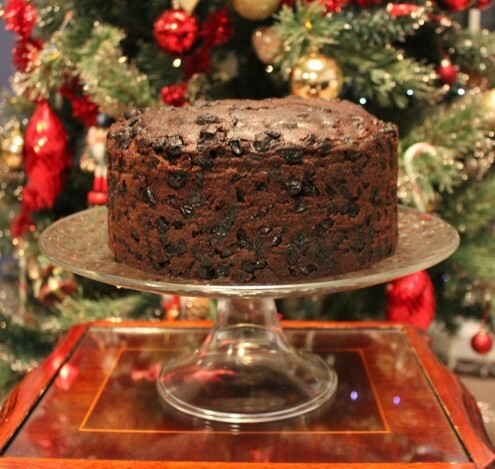 I must confess to not being the biggest fan of Christmas cake. It’s bizarre though because each year I find myself craving the spice and tradition of this festive treat so I have made a few tweaks to the recipe. I have left out the bits that I don’t like and replaced them with things that I love… and a healthy shot or two of Brandy! This is not a cake that can be whipped up on a whim as it needs 4-6 weeks to mature, with weekly Brandy baths. 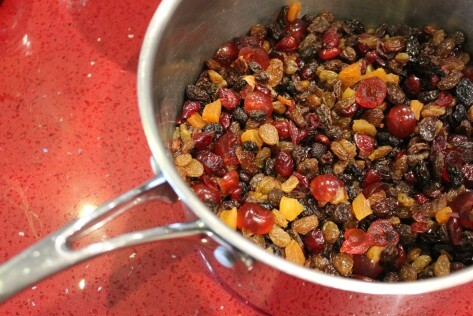 Begin by weighing all of your dried fruits into a large saucepan. Pour 450ml of Brandy over the fruits and warm gently over a very low heat. You will not need to stir continuously but please keep a close eye on the alcohol as it heats – you do not want the brandy to come to the boil. Stir your fruits to ensure an even coating in the warm alcohol. I find that a short 3-5 minutes of warming through in this way allows the fruits to plump up even more in their brandy bath. If you would like a deeper spice sensation, I recommend throwing a little sachet of mulling spices into the pan with your fruit and brandy – only use the ones that are sealed like a teabag and remember to remove this from your fruits BEFORE you start adding them to the cake. Remove your soaked fruits from the heat, cover the pan with tin foil, and leave to steep overnight. You can get away with leaving the fruits to soak for longer but aim for at least 8 hours before using them. Before beginning your cake, you will need to prepare your cake tin. I have written a whole separate page of instructions for ease of use so please ensure that you refer to these before you start baking up a storm. Just click anywhere on this section to see how to prep your tin. Cream the butter and sugar until pale. Allow 5 minutes for this job in a freestanding mixer or a few minutes more using a hand whisk. Add your eggs, one at a time to prevent curdling. 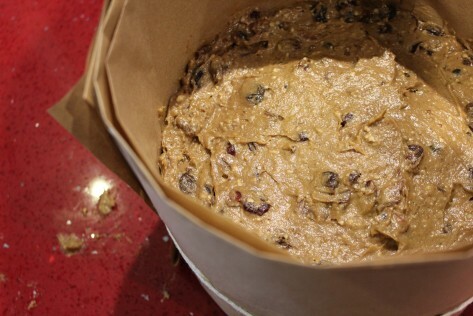 If your mixture threatens to split, throw in a spoonful of flour from the weight that you have measured for this cake. Once all of your eggs are incorporated, add your Orange and Vanilla Extracts along with the Treacle. Beat until evenly coloured. 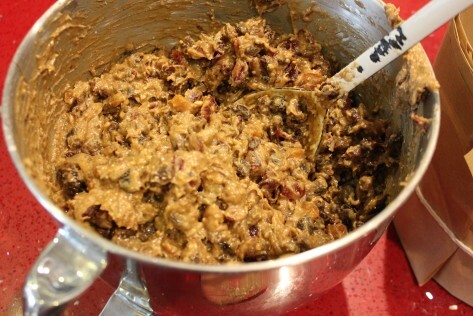 In a separate bowl, combine your flour, ground almonds, and mixed spice. Carefully fold one third of these dry ingredients into your cake mix, followed by one third of your Brandy steeped fruits. Mix until evenly distributed. Repeat steps 3 and 4 until all of your dry ingredients and fruits are combined in the cake mix. Spoon this heavy mixture into your prepared cake tin, ensuring that the mixture is pressed into the edges of the tin and smoothed down on the top, and bake for around 3 hours. As with all cakes, this one will be risen and springy to the touch when it is completely cooked. When in doubt, a cocktail stick inserted into the middle of your cake should come out clean. 3 hours usually does the trick but if your oven is notoriously fierce, you may want to check 10 minutes early. If your cake does not feel completely cooked through when you check, you can leave this cake in for up to around 3 hours and 10 minutes. When you take your cake out of the oven, drizzle over a tablespoon of Brandy and wrap in tin foil. As the cake cools, this little extra Brandy will infuse additional festive spirit into your cake. Leave this little parcel on a wire rack until it has cooled completely. This will take several hours. When your cake has cooled, you will be able to turn it out of its tin, keeping the greaseproof paper as a wrapping around your cake. 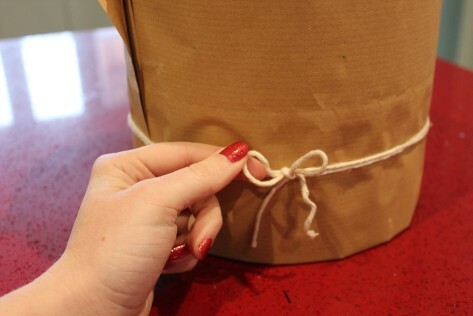 Wrap once more in tin foil, place in an airtight container, and keep in a cool, dry place. You will need to leave the cake to mature for at least 4 weeks before even thinking about serving it. 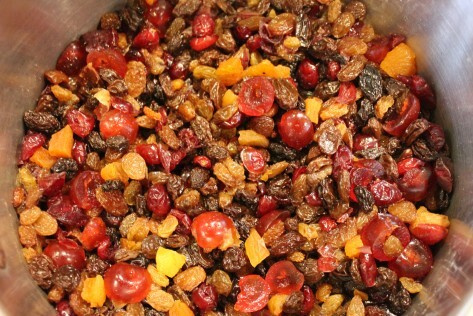 Each week, you should check on your fruitcake and feed it with a tablespoon of Brandy – each time you check it, the delicious smell will have deepened.